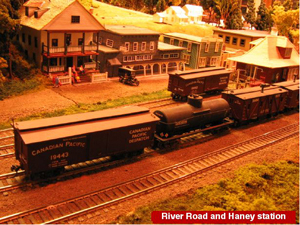 The Dewdney-Alouette Railway Society (DARS) has created this diorama, centred on Port Haney in 1926, on the lower level of the Maple Ridge Museum building. It is a labour of love that has spanned over 25 years, and the club members continue to work on this display weekly. The members of the club own all of the materials on the lower level including the non-diorama displays. 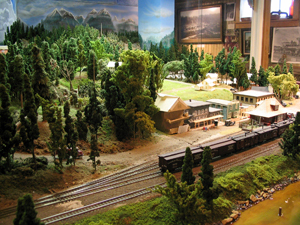 Some members like making the trains, while others focus on the buildings, and some prefer to do scenery and backdrops. 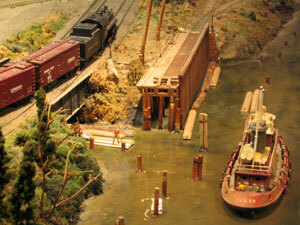 The diorama displays the CPR along the Fraser River from Hammond to Ruskin and the recent addition of sound brings back memories of the old steam locomotives. 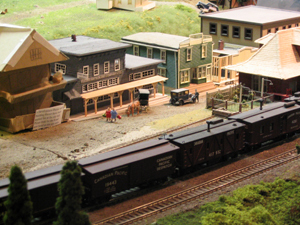 The club has an open house on the last Sunday of every month when they open the caboose [located on the museum grounds east of the main building] and run several trains at once and can answer questions for those interested in building layouts of their own.